Yes, I am editorializing. All religions do damage, especially to women. Thanks to Annie Laurie Gaylor, Director of the Freedom from Religion Foundation, for pointing out four articles in today’s New York Times. Each, from my/our point of view, shows how dangerous religious beliefs are, especially when they are used as the basis of law. The lead story on the front page, “For Somali Women, Pain of Being a Spoil of War” details atrocities in the name of religion, starting with a teenaged girl being buried in the sand, and stoned to death for refusing to marry a Shabab commander. Gone are the suggestive and supposedly subliminal images of campaigns past, as when Mr. Huckabee caused a stir in 2007 after releasing a commercial that appeared to show a cross floating in the background. The new, more pointed religious references reflect how campaigns are scrambling for support among evangelicals who are still divided over whom to support as the caucuses near. All of this has to be challenged directly if we want a world that values critical thinking and the well-being of women. In my decades of escorting women through anti-abortion protesters and into abortion clinics, I’ve observed that there are a variety of culturally different responses to the bullying, whining, pushing and threats. I’ve seen Latinas dissolve into tears and confusion when confronted at the clinic entrance by a priest saying the rosary over them, when they are told they’ll go to hell for “killing their babies.” Russian women tend to breeze by the antis as if they’re invisible, while white American women, more than any others, feel they have to answer for their personal actions to obnoxious and complete strangers. Black women (African American and West Indian) are the most likely, in my experience, to challenge the antis to “stay the f— out of my way!” Their anger at being interfered with comes out righteously. They don’t need anyone to tell them about their business. The anti-abortion movement has historically had a very difficult time getting support in the Black community, for this and other reasons (their own racism, for one). As part of the overall society-wide assault on abortion rights with includes murdering doctors, devising ever more state laws to restrict access, and the work of Democrats both overtly anti-choice and those who just seek common ground, the anti-abortion movement has recently put a lot of money and PR talent into blaming Black women for having abortions. Of course, they don’t say that directly. Several anti-abortion groups are funding a campaign to cast Black children as an “endangered species” because Black women have abortions. And more than that, they assert there is a concerted campaign of “Black genocide” fostered by an “abortion industry” that targets Black women who abort unintended pregnancies. There is so much incorrect, dangerous, and outrageous about every one of their contentions and methods, that I can only begin here a sketch. At the heart of the campaign to shame and control Black women is a film called Maafa 21. See the trailer at blackgenocide.com (striking footage and dramatic music: high production values and serious funding behind this effort). It starts from the assumption that slavery of Black people in the United States was followed by an attempt by “America’s wealthy elite” to make Black people disappear. Well, that’s true. An unemployment rate of 50% for African American men in NYC. 2.4 million people incarcerated, a huge proportion of them Black. The lowest life expectancy among any group in the US, and a higher infant morality rate. Higher rates of deadly diseases, and lower levels of health insurance. Higher rates of combat death in every war from the Civil War on. This is systematic oppression of Black people! But those behind Maafa 21 don’t care about any of that, least of all actual living Black people. The film weaves aspects of true facts — including the scientifically wrong eugenicist views of Margaret Sanger who fought in the early 20th century to bring birth control to poor women and founded Planned Parenthood — into a conspiracy by abortion providers today to “sell” abortions to Black women in order to reduce their birth rate. This is all wrong, backwards, and very dangerous. I would challenge anyone giving this film any credence to look at who made it, and how it’s being used. Credit goes to “Life Dynamics,” a group in Texas run by one Mark Crutcher. After a career in “promotion of automotive products” (used car salesman), Crutcher branched out to targeting abortion doctors over the last two decades, and sending a threatening pamphlet to medical students in the 1980′s. He specializes in “intelligence” against abortion providers. He has no history or connections with any movement endeavoring to protest, nor better, the lives of Black people in this country. 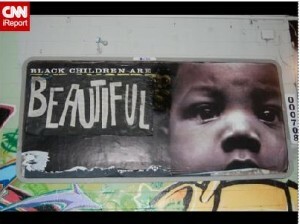 Black children are BEAUTIFUL - the billboard is corrected. This aggressive disinformation campaign goes beyond a film. 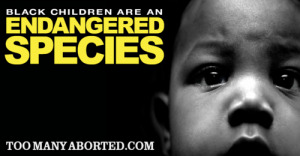 Georgia Right to Life put $20,000 into 80 billboards in Atlanta in January calling black children an “endangered species.” Some of the billboards are still up, and there are plans to spread them to other cities with large Black population. I see one got a welcome alteration last week (Black children are beautiful members of the HUMAN species!). For more on the actual restrictions this will place on women who need abortions, see Black Abortion: Battleground Georgia on RH Reality Check. We must and will answer the lies in this “Black genocide” argument. 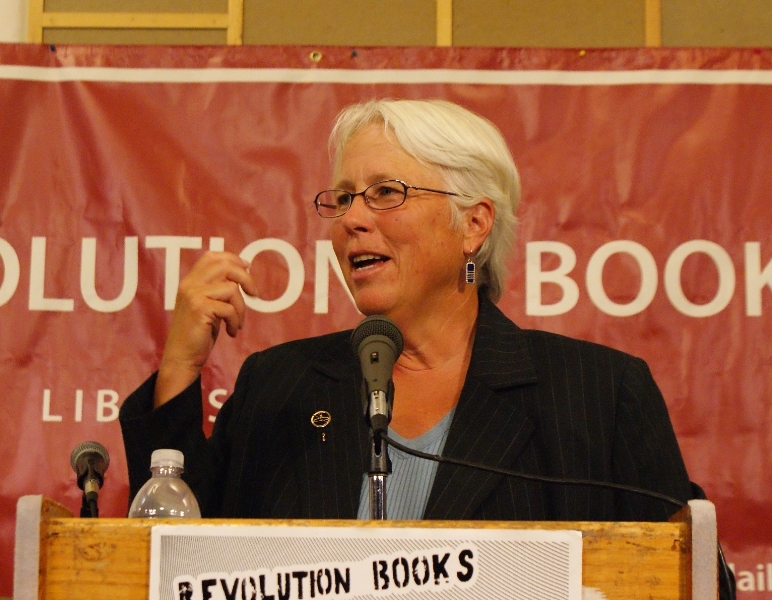 Leaders in the fight for reproductive justice are already doing so. “They tell African American women that we are now responsible for the genocide of our own people … We are now accused of ‘lynching’ our children in our wombs and practicing white supremacy on ourselves… This is what lies on steroids look like. A recent study by the Insight Center for Community Economic Development revealed that single black women have on average only $100 in personal wealth, compared with $41,500 for single white women. With less disposable income, many black women are shut out of the booming reproductive technologies market available to their white peers. In this twisted sense even college education could be argued to constitute racial genocide. Everyone agreed that women — including women of color — can determine what they need to do for each pregnancy. And no government, husband, father, religion, Pope, or group of lunatic murderers with a budget should force motherhood on any woman. Angie the Anti-Theist stirred up a lot of controversy by live-tweeting as she had a medical abortion last week, as a public service. Thank you Angie! Angie says, “I found out about a week ago Saturday that I was pregnant. For a variety of reasons, including very high health risks for me, I’m having an abortion. Right now. They have abortion by pill now, RU 486. I went to the doctor, Planned Parenthood, had blood tests and everything else done. They did a sonogram to check the state of my pregnancy. I was at only four weeks one day when I went into the office on Thursday. They sent me home with medicines, and I’ve taken those. It takes awhile to set in, and I ended up getting a second dose. I’m having an abortion right now. It’s not that bad, it’s not that scary. It’s basically like a miscarriage. I’m live tweeing my abortion on Twitter. Not for some publicity stunt, or attention, or to justify this to myself. I am at peace with my decision. I’m doing this to de-mystify abortion. I’m doing this so that other women know, hey, it’s not nearly as terrifying as I had myself worked up thinking it was. It’s just not that bad. This is nothing compared to childbirth, compared to labor, compared to for me, and my risks, late stage pregnancy. This is the best choice. It’s not that bad. And I want people to know that it’s out there. If you need this, there are non-surgical oprtions available, especially in the earliest stage of pregnancy. Jackson, whose special-needs son was born after a grueling 98-hour delivery, says her motivation is to counter the stories of regret the anti-abortion movement has cultivated in recent years. As the controversy continues, one of the most interesting—and motivating—parts of her narrative has been largely overlooked: her intimate connection with a religious movement—one she now calls a cult—that glorified fertility and childbirth and demonized medical intervention even when mothers’ labors were going very wrong. What Does “C B S” Stand for? If they air the Focus on the Family ad Sunday in the Super Bowl, CBS should change their name to “Christian Broadcast Syndicate”. We’re taking signs tomorrow to CBS headquarters with creative uses of the acronym “CBS”. Bring your own, or post your ideas here so we can make signs are represent you. “Christian Broadcasting Syndicate?” “Cancel Sexist Broadcasting”? “Complete B– S–?” Be creative! 6th Avenue & 52nd Street in NYC or on Facebook here. Yesterday’s blog post on this subject. Photo Op: What does “C B S” stand for? Proponents of choice for women facing unplanned pregnancy will deliver more than 200,000 letters Thursday to CBS headquarters urging the network not to run an ad with an anti-abortion message in Sunday’s 2010 Super Bowl broadcast. The 30 second ad purchased by Focus on the Family has generated controversy because CBS had previously refused to run ads deemed to have a political or controversial message, including a 2004 message from Moveon.org critical of President George W. Bush and a message from the United Church of Christ welcoming gays into their church. The ad in question features Pam Tebow, mother of NFL star Tim Tebow, on her choice to continue her pregnancy in 1987 while a Christian missionary in the Philippines, despite being advised by physicians to consider termination to avoid potentially dangerous complications to her health and loss of her life. “Focus on the Family does not promote harmless ‘family values’ but Dark Ages ideology. They actively oppose abortion, even to save the life of the woman, and birth control; say that gays are an ‘abomination,’ and that the earth was made 6,000 years ago. They actively organize their millions of supporters to protest at abortion clinics and exclude gay and lesbian members of their churches. That CBS is allowing them to breach a wall into the Super Bowl, and reach millions with their anti-abortion message is an outrage” said Debra Sweet, Director of the World Can’t Wait. More than 200,000 protest messages were collected by Credo Action and the Women’s Media Center. World Can’t Wait is sponsoring the street protest. One thing we can be absolutely clear about: abortion opponents do not care about the pain of women. Proof of that is the fact that they orchestrate a parade of women to take the stage, sometimes literally, and tell wrenching stories of how sad, guilty, or devastated they are because they had an abortion years ago. The great majority of those women would have dealt with their feelings about abortion and done fine if they hadn’t run into the “abortion is murder” cabal. They would have felt the main emotion most women feel after ending an unplanned pregnancy: relief, sometimes accompanied by regret that they couldn’t bear a child at that time. But now they’ve become symbols of how women, allegedly, are not responsible enough to run our own lives, and make our own decisions. The main mission of the anti-abortion movement is to cause women pain, keep us subservient and unable to control the one most basic aspect of our lives: when and if we will bear children, and under what terms. Now that Scott Roeder has admitted he fantasized and planned for almost 20 years to kill George Tiller before he actually did it on May 31, and he’s become a martyr to their movement, it looks like he will do some long prison time. But the anti-abortion movement is quickly moving on to another target, Dr. Leroy Carhart, who announced last month that he’s doing later term abortions in his Nebraska office. Dr. Carhart’s clinic is picketed daily by up to several dozen protesters. Troy Newman, who succeeded in creating a climate in Wichita in which Dr. Tiller was killed, then complained to the Nebraska Attorney General over non-existent violations in Dr. Carhart’s office. 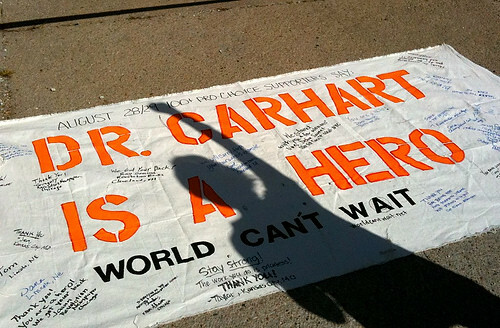 World Can’t Wait and other pro-choice groups sent thousands of messages of protest to Jon Bruning, the Attorney General, telling him to protect Dr. Carhart, not harass him. Omaha.com reports that 5,000 participated in this year’s Walk for “Life” in Omaha. Now comes the Abortion Pain Prevention Act introduced by Nebraska Speaker of the Legislature Mike Flood on Jan. 21. “The Abortion Pain Prevention Act takes us into a whole new world of abortion law, banning all abortions after 20 gestational weeks on the basis of a preborn baby’s capacity to feel the pain of it all. At this age a baby anatomically “has the physical structures necessary to experience pain,” states the bill, based on scientific evidence. Stanek presents some photos of tiny babies, possibly alive, but with no indication of what they illustrate, with the comment that “if born, particularly at 23 weeks or older, wanted babies often live and thrive.” True. The operative word here is wanted and the woman in whom they reside will be the judge of that, not Stanek, Flood, Roeder, Newman or Randall Terry. Dr. Carhart, for his part, said on KETV News in Omaha that he’s ready for the battle. I have no doubt that he is, in that he’s weathered two Supreme Court cases, the total destruction of his home and barn in 1991, along with his horses, the loss of his best friend in Dr. Tiller, and he’s continuing to push forward even more strongly to care for women when they need abortion. So, let’s back him up! Many of you stood on the streets of Bellevue, NE this past summer with us, standing between “Operation Rescue” and his clinic, or signed a petition last month against the complaints filed by OR and their associates. Dr. Carhart’s office has issued a request to all supporters, for a “flood” of messages against this harmful abortion ban to be sent to the legislator who introduced it. If you send a message, please cc Dr. Carhart’s office at info@abortionclinics.org so that he at least can keep track of the support, even if the Nebraska Legislature doesn’t. I tried to follow the logic of the anti-abortionists supporting Scott Roeder as his defense argues that he was compelled to kill George Tiller to “save the babies.” Donna Holman rode the TruthVan to Wichita, joined by Michael Bray (late of Virginia, having served time for bombing a clinic in the 80′s), but is very critical of the rest of the anti-abortion groups for not being as visible as their van is. “Mr. 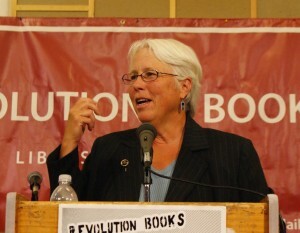 Roeder acted as if the children Tiller killed were worth defending, a big “NO-NO” in pro-life circles. Pro-lifers cannot come up with a logical argument as to why the double standard? Why is it OK to use force, even deadly force, to protect a classroom of kindergarten children, but it is forbidden to use force to protect pre-born children slated for abortion? Are pre-born children worth less than post-born children? If so, we have tacitly admitted that a mother DOES have a right to kill her unborn child! Her unborn child is somehow sub-human and NOT entitled to an inalienable Right of Life. It’s hard to know where to start with this, but let’s go for the last point that the “authorities” protecting George Tiller were responsible for his murder. George was shot at close range twice, the second time fatally by Scott Roeder on May 31. His clinic, home, staff, and patients were constantly harassed for decades, with an all-out assault starting in 2001 by Operation Rescue, whose leader, Troy Newman, moved to Wichita with the sole purpose of “taking out” Dr. Tiller. The authorities did not protect George. The whole “pro-life” cabal played their separate parts in leading to his murder; the thousands who gathered to surround his clinic in 1991 and 2001, threatening him and the patients; those who came more regularly to surround the clinic, and picket the homes and businesses of his staff and their families. How about the former Attorney General of Kansas, Phil Kline, who took George to court, twice, unsuccessfully, on completely bogus charges, but in the meantime tried to get the records of thousands of his patients? Check this out: that same Phil Kline, no longer in office, and living out of state, will be in court testifying for Roeder’s defense Thursday. The “authorities” may not be directly pulling the trigger to kill abortion doctors as Ms. Donna Holman wants, but they’ve played their own role in making abortion dangerous for women and doctors. Elective pregnancy termination remains the most widespread, and safest, of all minor surgical procedures in the U.S. and in fact early abortions aren’t surgical at all. The anti-abortion movement is not about saving babies. It’s purpose is to keep women locked into forced motherhood. None of us can pretend to know what Dr Tiller would say to us right now. We know what he used to say about understanding the heart of a woman. We know what he believed about each woman having the knowledge to really understand what was best for HER. We know, tragically, that he gave his life for what he believed in. We know that his family lost a husband, a father, a grandfather, We know that the Pro Choice movement lost one of our biggest heroes, a compassionate, extremely competent physician, a voice that spoke truth, a rock we all thought could never be moved. What we DON’T know is what will become of the women in this country if the right to safe, legal abortion continues to be eroded and compromised and marginalized and becomes even more inaccessible. We don’t know to what extent the anti-choice forces will go to deny even more women the right to control their own destinies. We don’t know how many more clinics will be burned, staff terrorized or doctors killed. We don’t know if our government will actually step up and make sure abortion is treated as the basic health care we all know it is. But I personally know this: George Tiller would tell us to never back down, to never stop telling the truth, to never forget the individual woman who walks in the door of a clinic in need of help in ending a pregnancy she is not prepared for. And he knew that this is about us. All of us. And it is about your mothers and wives, your sisters and daughters and granddaughters and best friends. It is about someone else wanting to control us. It is about power. Please, in honor of Dr George Tiller, use your voices and your presence and your hearts to keep abortion safe, legal and available to every woman, to every family that needs this care. This is not some esoteric concept. This is a matter of life and death. When Does Murder Become Manslaughter? When does a charge of murder get reduced to a charge of manslaughter? Possibly, when the murder victim is a doctor who does abortions. 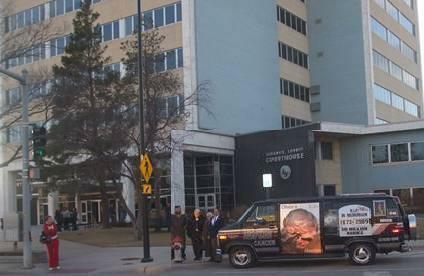 Scott Roeder is on trial in Wichita KS for the murder of Dr. George Tiller on May 31, 2009. Roeder, an anti-abortion activist for many years well known around Kansas, admitted to authorities that he killed Dr. Tiller by barging into the church where George was ushering, and shooting him. George died immediately; Roeder fled, and was caught within a day. The drama playing out in Wichita is not whether Roeder will be found guilty, but what he will be found guilty of. He’s charged with murder by the state of Kansas. However, his defense team has argued to the judge that they should be allowed to present evidence that Roeder was motivated by his anti-abortion convictions, and therefore should not be convicted of murder. Roeder claims that he gunned down Tiller at Sunday church services on May 31, 2009, in order to “save the lives of preborn children.” Based on this claim, Roeder intends to invoke the “necessity defense” predicated on the idea of “justifiable homicide.” If presiding judge Warren Wilbert accepts this defense strategy, and he appears to be leaning that way, he will give jurors the option of convicting Roeder not of premeditated murder but instead of voluntary manslaughter. That lesser crime is defined as “an unreasonable but honest belief that circumstances existed that justified deadly force” under Kansas statute. If convicted of involuntary manslaughter Roeder could be out of prison in five years. We are investigating the report that Judge Wilbert was endorsed for his judgeship by anti-abortion groups in Kansas. If he allows Roeder’s team to present testimony from an array of anti-abortion politicians and activists, it would be an extraordinary departure. That would not necessarily convince a jury that Roeder was justified in killing Dr. Tiller. But consider this: yesterday the judge shut out the media from jury selection, saying that abortion is such a controversial topic that jurors would fear to state their thinking on it publicly. I think it is very relevant why Roeder killed George Tiller. We’ve made the point repeatedly that he was influenced directly by Operation Rescue who relentlessly targeted George for over a decade, and by the Kansas politicians who harassed George with lawsuits and even criminal charges, unsuccessfully. (George always prevailed in court). So what if Roeder does actually believe he’s saving fetal life by having killed George Tiller? He killed a living human being, and that’s murder. I, along with 5 other anti-war activists, will be going on trial this spring on misdemeanor charges of “disorderly conduct” for protesting in Philadelphia at the entrance to the Army Experience Center. If we had been outside the doors cheering the Army’s recruitment efforts, we would have been welcomed, as the Army welcomed the pro-war bikers they allowed to jeer us. But because our message was opposition to the war and the recruitment of kids with video games, we were arrested. It’s relevant to our defense that we were arrested for the content of our non-violent protest message. We will argue that we should be allowed to mention why we were protesting. Anti-war protesters Emma Kaplan and Patty Imani may be allowed to speak of their reasons for protesting at their trial on January 25 in Tacoma WA, where anti-war protesters were spied on by the military. But what happens to the Roeder prosecution should be followed by everyone who cares about the safety of abortion doctors, and the humanity of women seeking abortion and birth control. The National Organization for Women in Wichita will hold a vigil on Friday night, January 22, for abortion rights. For the 36 previous anniversaries, of the Roe v. Wade decision making abortion legal, George was in Wichita, providing abortions. Will the anti-abortion lunatics already be celebrating by the end of next week because in Kansas, you might be able to carry out a political assassination, and get made into a hero? 1,249 supporters of Bellevue, Nebraska abortion provider Dr. LeRoy Carhart are calling on Nebraska Attorney General Jon Bruning to reject Wichita-based Operation Rescue’s complaints against the doctor. Senator Ben Nelson, a Democrat who forced abortion-limiting language into the Senate health bill passed Saturday, is also from Nebraska.